Rachel Gillett is working as System administrator at Universal Containers (UC). She has received a requirement from the management, they want to allow their Sales reps (License Type: – Salesforce Platform) to delete a Chatter conversation from Salesforce UI. 1) ConversationId: – ID of the conversation that the ChatterMessage is associated with. 1. First of all, grant Manage Chatter Messages permission to your user record (Via Permission Sets), to create a Flow. Otherwise, you will get the following error while building a Flow at step 3. Later on, you can remove this permission set from your user record. Make sure that you have marked the field Chatter_Conversation_Id__c as required, Unique (Case Sensitive) and also granted CRUD access to the respective profiles. 7. Save your Flow with name Delete Chatter Conversation and close the canvas. Don’t forget to Activate the Flow. If you want, you can now remove the permission set from your user record that you have used to grant Manage Chatter Messages permission. No extra permission is assigned to this user apart from Create and Read permission on the Delete Chatter Conversation object. Now the million dollar question is how to get the Id of Chatter conversation as a business user when you can’t run a query. Once you’re done, click on the Save button. 6) Navigate to the Chatter messages and check it out now. The conversation is started by System Administrator Rakesh Gupta gets deleted. Note: – You can be only able to delete those Chatter conversation in which you are included, else you will get an error, i.e. There is nothing in Salesforce matching your delete criteria. It’s not applicable to the system Administrator with the Manage Chatter Messages permission. 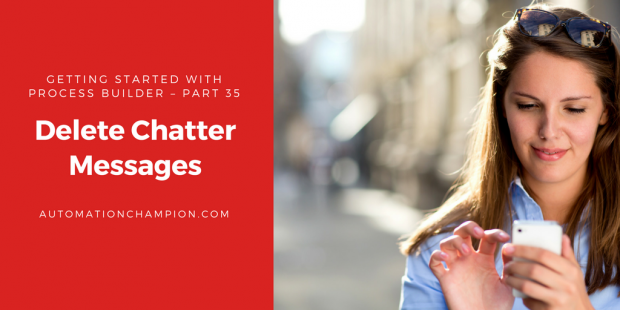 Basic but very important, first of all, you have to understand Chatter messages and Chatter Conversation in Salesforce. Chatter messages let you have secure private conversations with other Chatter users. Use messages to send your colleague a question privately, or to communicate with a few selected people when a discussion isn‘t relevant to everyone you work with. Whereas Chatter conversation is consisting of messages that conversation members have sent or received. 1) A private message can include up to 9 members, including yourself. 2) Messages sent will not be viewable through Chatter feed, Chatter Profile, or Global Search results. 3) You can’t delete messages or conversations. 4) An administrator with the Manage Chatter Messages permission can view and delete all users‘ messages in Chatter for example, for compliance purposes. —> Messages are hard deleted. They aren’t sent to the Recycle Bin. —> Deleted messages aren’t included in message search results. —> If all messages in a conversation are deleted, the conversation doesn‘t show in My Messages and can’t be retrieved via the Chatter REST API. 5) If after reading the messages in a conversation you want to mark the conversation unread, you can do so only via the Chatter REST API, not via the user interface. Rachel Gillett is working as System administrator at Universal Containers (UC). She has received a requirement from the management, they want to allow their Sales reps (License Type: – Salesforce Platform) to delete Chatter messages one-by-one from Salesforce UI. 2) ConversationId: – ID of the conversation that the ChatterMessage is associated with. Make sure that you have marked field Chatter_Message_Id__c as required and also granted CRUD access to the respective profiles. 7. Save your Flow with name Delete Chatter Message and close the canvas. Don’t forget to Activate the Flow. If you want, you can now remove the permission set from your user record that you have used to grant Manage Chatter Messages permission. No extra permission is assigned to this user apart from Create and Read permission on the Delete Chatter Message object. Now the million dollar question is how to get the Id of Chatter message (i.e. What’s up?) as a business user when you can’t run a query. 6) Navigate to the Chatter messages and check it out now. The message (i.e. What’s up?) sent by System Administrator Rakesh Gupta gets deleted. Note: – You can be only able to delete those Chatter messages in which you are included, else you will get an error, i.e. There is nothing in Salesforce matching your delete criteria. It’s not applicable to the system administrator with the Manage Chatter Messages permission.